Loftleidir Icelandic’s subsidiary has submitted a binding offer for majority shares of Cabo Verde Airlines. Loftleidir Icelandic, a subsidiary of Icelandair Group, will, together with Icelandic investors, submit a binding offer for a 51% of the shares in Cabo Verde Airlines on Cape Verde. Authorities in Cape Verde and Loftleidir Icelandic have been cooperating for some time. In August 2017, Loftleidir Icelandic signed a management agreement with the Cape Verde Government on restructuring Cabo Verde Airlines. The agreement also aimed to strengthen the international airport in Cape Verde, to develop the islands as a promising tourist destination and to build an international hub for connecting flights. Coinciding with the agreement, it was announced that the company was due to be privatised. Cabo Verde Airlines already has operating licenses to fly scheduled flights to Europe and the United States. The purchase price is confidential. However, the acquisition would partly be paid for by the work already completed by Loftleidir Icelandic’s employees. The acquisition is made through a new company, Loftleidir Cabo Verde. Loftleidir Icelandic holds a 70% stake in the company, and other investors 30%. Loftleidir Icelandic’s acquisition of Cabo Verde Airlines does not have significant effect on Icelandair Group’s financial statements since Cabo Verde Airlines will not be reflected in the group’s consolidated financial statements. The share will classified as an associated company. Top Copyright Photo (all others by the airlines): TACV-Cabo Verde Airlines Boeing 757-2Q8 D4-CBP (msn 30045) AMS (Ton Jochems). Image: 932908. 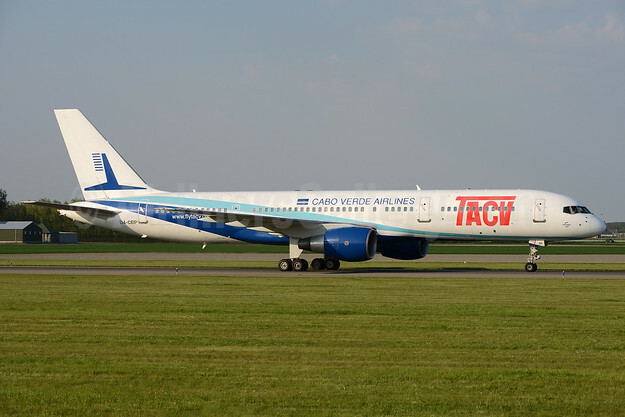 This entry was posted in Cabo Verde Airlines, Loftleidir Icelandic, TACV-Cabo Verde Airlines and tagged Boeing 757-2Q8, Cabo Verde Airlines, D4-CBP, Loftleidir Icelandic, msn 30045, TACV-Cabo Verde Airlines on November 27, 2018 by Bruce Drum.